This Dutch armoire, dowry cabinet or "Kas" from around 1920 traditionally descends with a family's daughter when she marries. Adjustable shelves and drawers would have held a bride's linens, pewter and silver. A secret compartment on the top held valuables. An especially grand Kas from a proud and prosperous family, the finish is original and is in excellent condition with minor touchups. 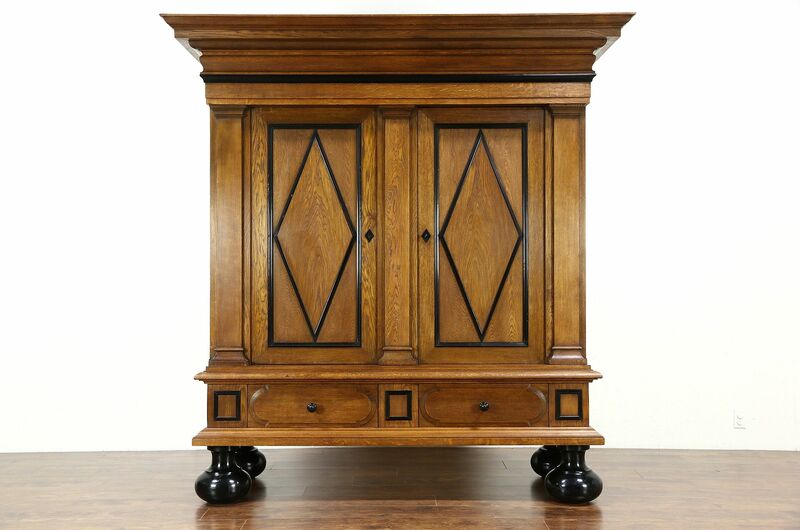 The classic design of this cupboard dates from the Renaissance with bold moldings and massive feet. Fine grained European oak was accented with ebony from the Dutch East Indies colonies. The door has a working lock. As prized heirloom furniture, the workmanship is exemplary on this importantly scaled furniture from Holland. Built to endure for centuries, every joint in the cabinet sections and drawers has giant hand cut dovetails. This grand and historic vintage armoire separates into three stacking sections for easier moving. Size is 7' wide at the crown, 32" deep and 88 1/2" tall.